Why, oh why, is this a conspiracy? Someone on YouTube says they think that weather radar thunderstorm images are volcanic eruptions, and the news spreads so fast that a U.S. Geological Survey official has to issue a statement saying that there is no eruption going on. A government denial, of course, is a gold mine for conspiracy nuts, because it gives them some kind of stature. It becomes a story that may or may not fade away...especially as 2012 and the end of the world approaches! 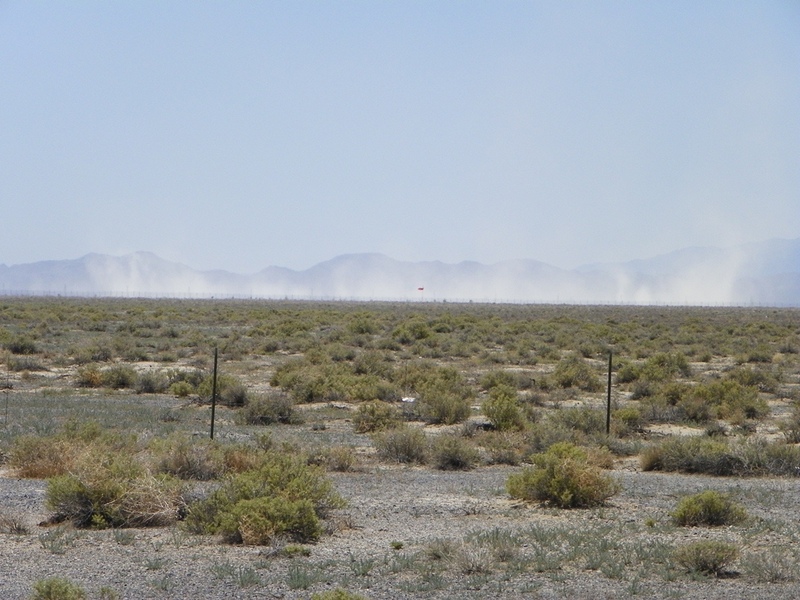 The most ironic thing about this supposed eruption is that the Pisgah Crater sits in full view of Interstate 40 east of Barstow (most of the other alleged eruptions are near highways, too). An eruption would have been reported and photographed by literally thousands of travelers. 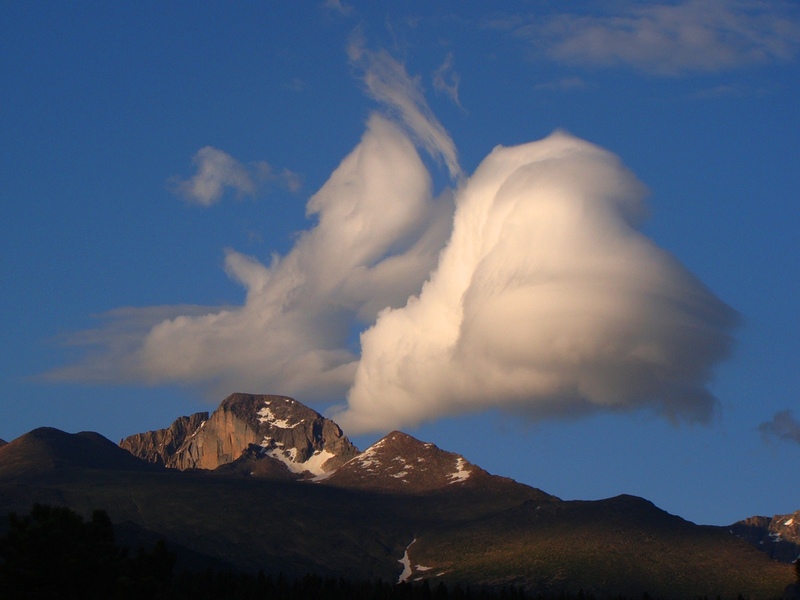 Eric Klemetti of the geoblog Eruptions, as always, has the full story. Check it out. Is it possible that a volcanic eruption could take place in California or anywhere else in the American West? Absolutely! 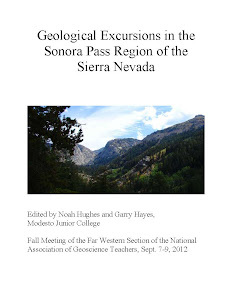 The possibilities range from phreatic (groundwater) explosions at places like Death Valley or Mammoth (look up Inyo Craters or Ubehebe Craters), cinder cone eruptions at dozens of localities (Modoc Plateau, Cascades, Basin and Range, Coast Ranges), somewhat more violent eruptions of plug domes or stratovolcanoes (Mt. Shasta or Lassen Peak), and even the highly unlikely rhyolite caldera eruption of a place like Mammoth Lakes (Long Valley Caldera). California had an eruption sequence at Lassen from 1914 to 1917. The thing is, if an eruption were imminent, the government and U.S. Geological Survey would be actively monitoring events and working to protect lives and property. You can't hide a volcanic eruption, and really, why would anyone try? I'm sort of disappointed that my UFO and alien post last week didn't go viral this way! The picture above is the Black Rock Crater, a 20,000 year old basalt flow in the Lunar Crater Volcanic Field in central Nevada. It is one of hundreds of young cinder cones scattered across the American West. Our continuing journey through the Pacific Northwest and the Northern Rocky Mountains, the Convergence of Wonders, reached the twelfth day. We woke up in our Colter Bay campsite and set out to explore Grand Teton National Park. The Tetons are in the Rocky Mountains, but they are not of the Rocky Mountains. 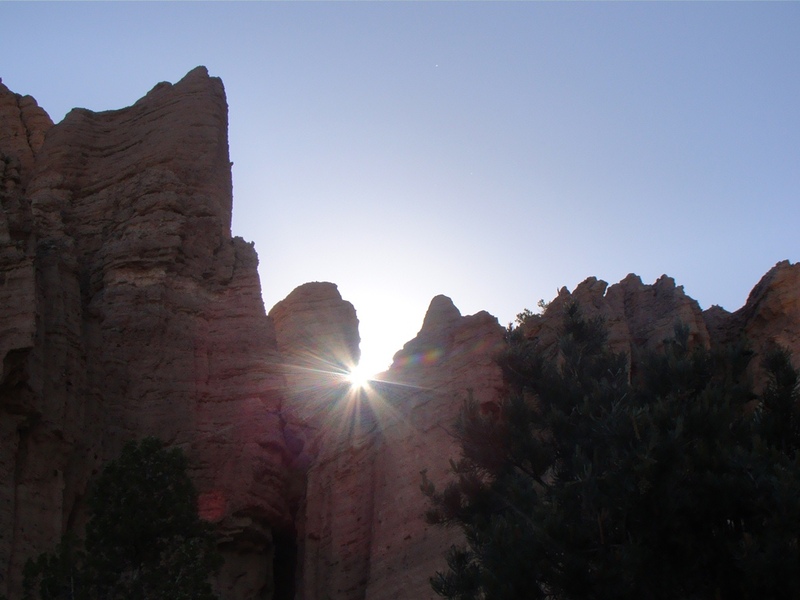 The rocks are right, but not the origin of the peaks themselves. Most of the mountains we visited since leaving Washington were the direct result of convergent tectonics, that is, the result of subduction along the west coast of the North American Continent. The forces involved are usually compressional in nature, but the Tetons are the direct opposite. They form because the earth's crust is extending; it is being ripped apart. 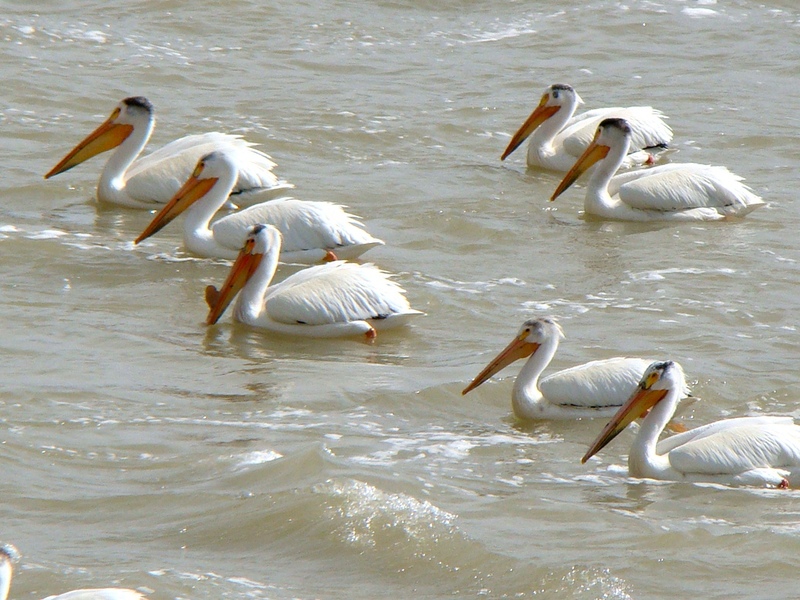 But first, the pelicans! We stopped at Jackson Lake Dam to have a look around (the picture above was taken from on top of the dam), and could see dozens of white things floating in the rushing waters below the dam. 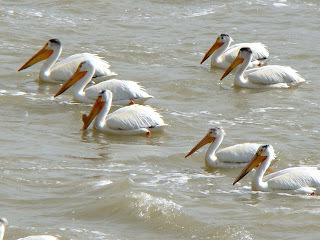 A zoom shot revealed the objects to be American White Pelicans. I suppose they get good fish at the outlet. We then drove to the summit of Signal Mountain to get one of the best views of the Grand Teton region. 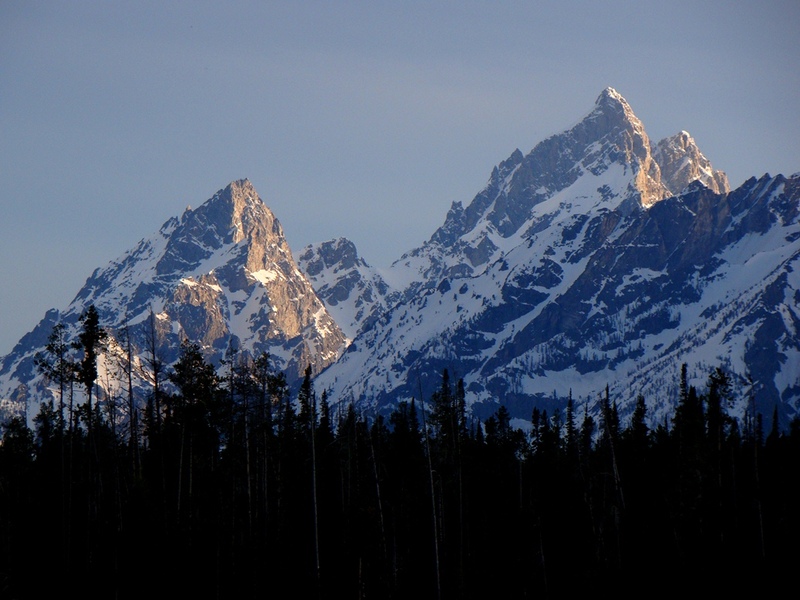 The Tetons have an interesting glacial history. 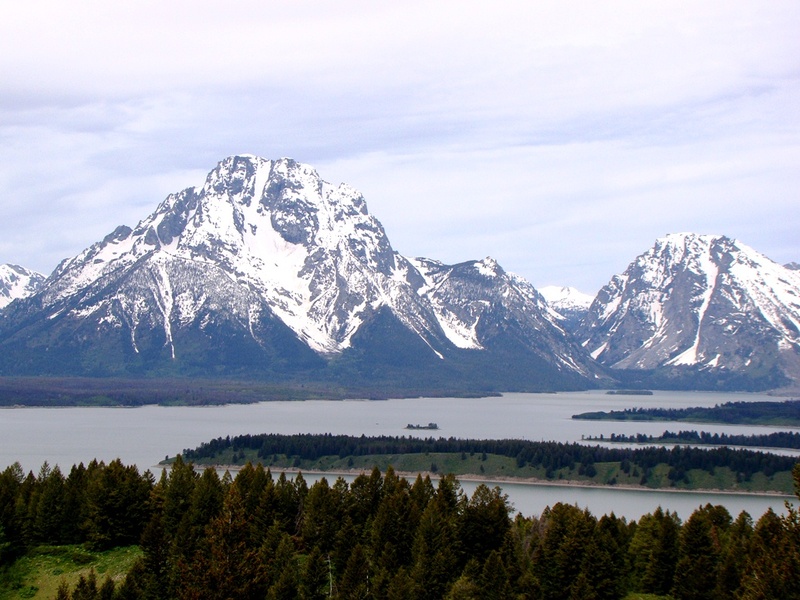 Where Yellowstone was covered by an ice cap, most of the Tetons were dominated by alpine glaciers confined to mountain canyons. 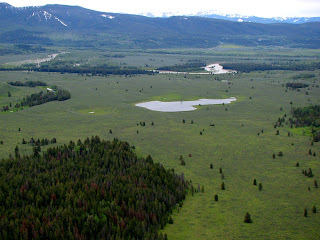 Some of the Yellowstone ice cap flowed to the south around the base of Signal Mountain, so the most notable features at our feet included the Potholes, a group of kettles and kettle lakes left behind by stagnant masses of ice (below). We had a stunning view of the Teton crest and Jackson Lake from the peak of Signal Mountain (although I think some of the students missed the view as they tried to get a signal on their cellphones). 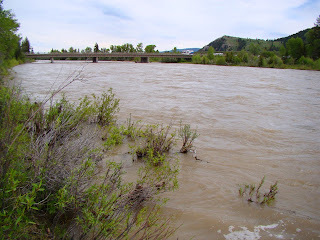 We then headed out of the park briefly and crossed the swollen Snake River. All the rivers we saw this trip were very close to flood stage, and even now in late July they apparently are still running high and cold. 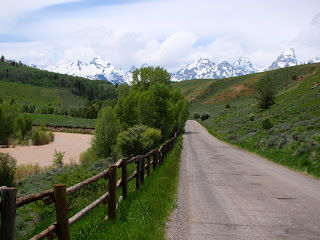 Our destination was a little east of the park in the canyon of the Gros Ventre River. Most visitors to Grand Teton National Park never go out this way, and they miss one of the remarkable geologic sights in Wyoming: the Gros Ventre Slide. 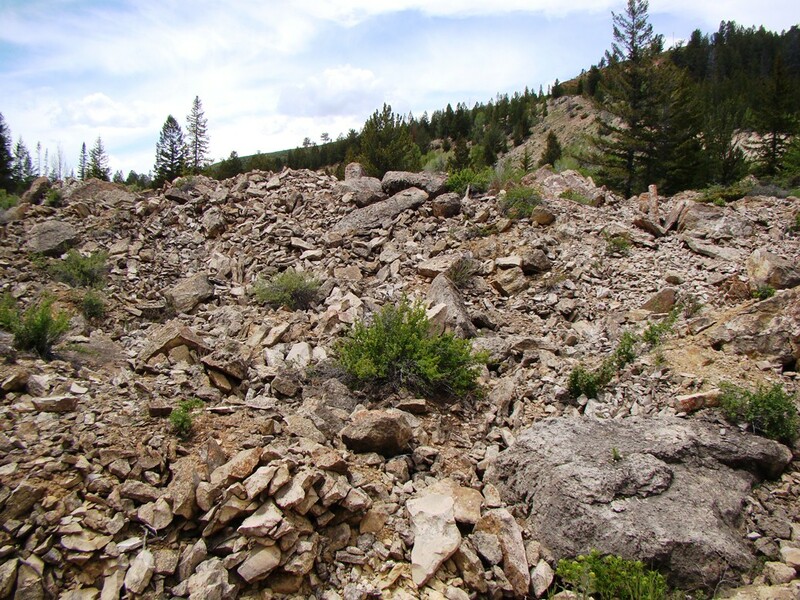 A series of Paleozoic sedimentary rocks are found in the area; the layers sloped north into the valley at about 20 degrees. 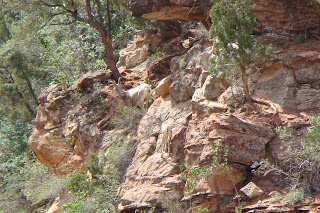 Tensleep sandstone was exposed at the surface, and was underlain by much weaker shale and mudstone. 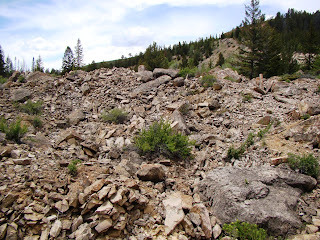 Weeks of heavy rain had destabilized the rocks, and on June 23rd, 1925, a large mass nearly a mile long and 2,000 feet wide gave way and slid into the valley. It had a volume of around 50 million cubic yards. 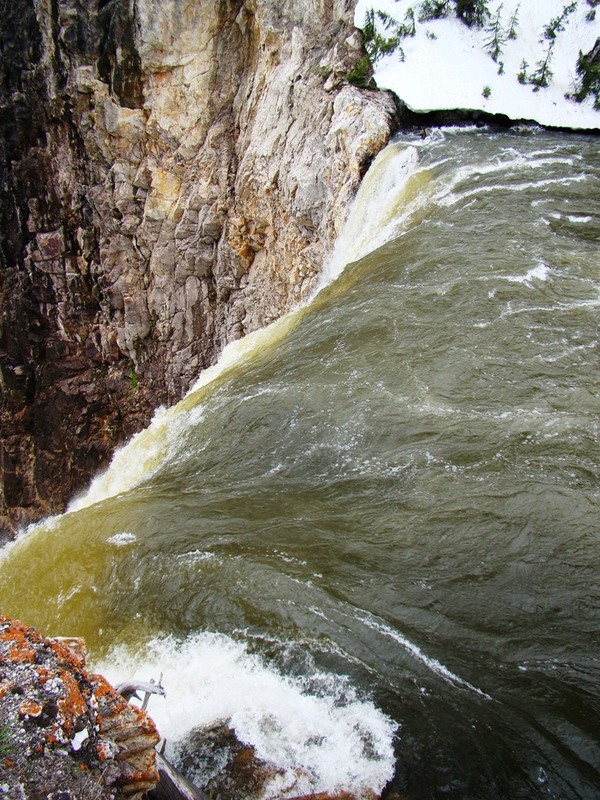 The avalanche produced a debris dam more than 200 feet high. 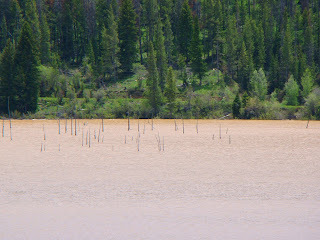 The Gros Ventre River began filling the new "reservoir". It was two years before the dam filled, and when the water breached the top of the dam on May 17th, 1925, the weakness of making dams out of loose debris became immediately apparent: the rushing waters tore away at the top of the dam, and much of the lake emptied into the riverbed below. Several miles downstream, the town of Kelly lay unprotected. The resulting flood killed six people and the town was washed away. 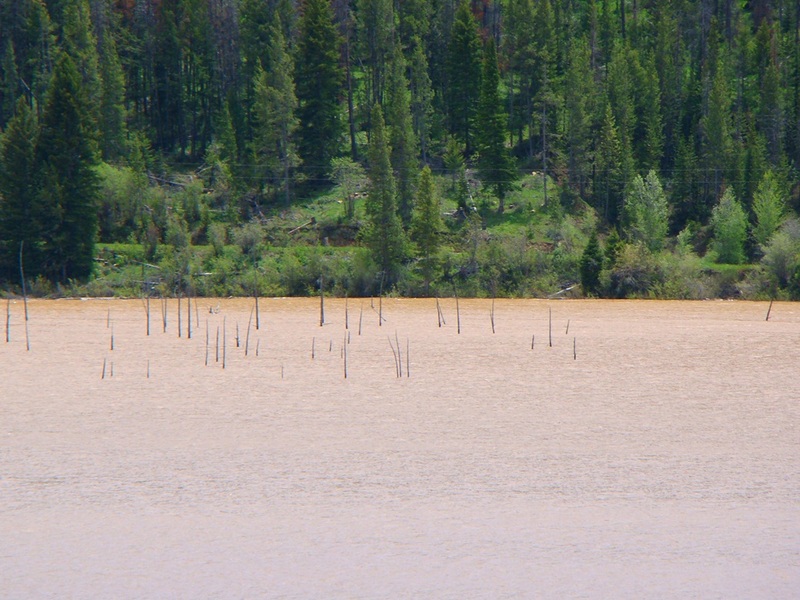 A ghostly forest of dead trees can be seen standing in the middle of the lake. 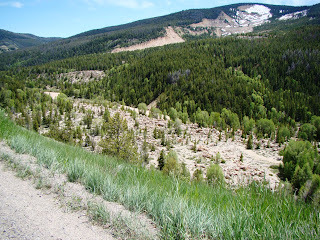 The road back into the park provided spectacular views of the mountain crest. 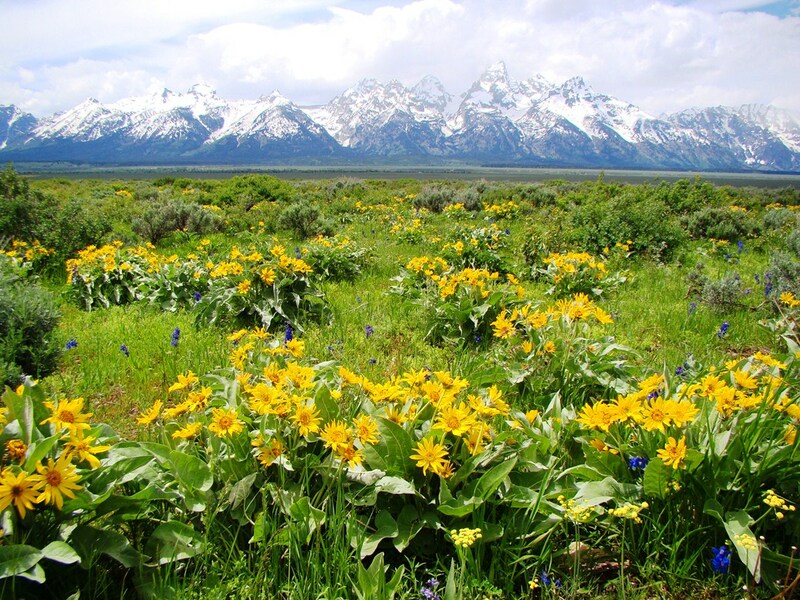 Flowers were blooming all across the Antelope Flats area. 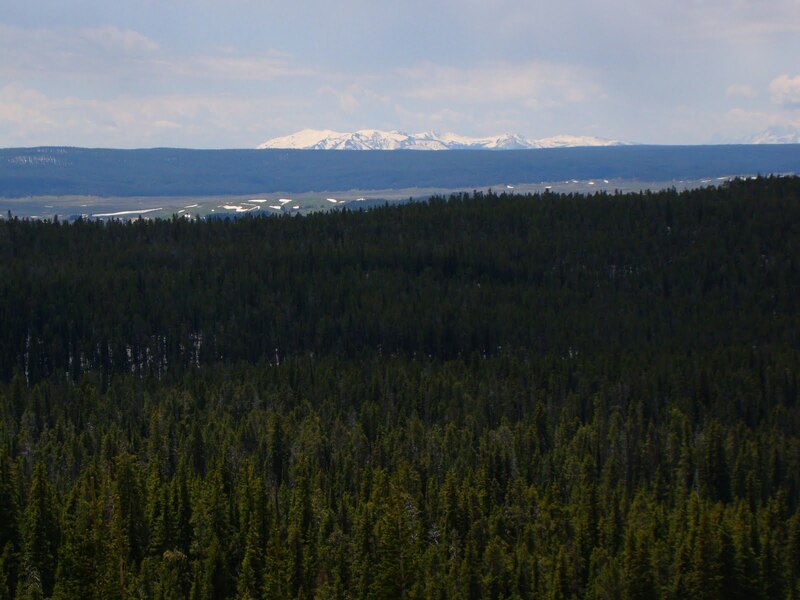 The fault line that produced the mountains has moved the mountains upwards to heights of 13,000+ feet, while the valley floor has at least 10,000 feet of sediment filling it in. The fault has moved some five miles in the vertical sense! 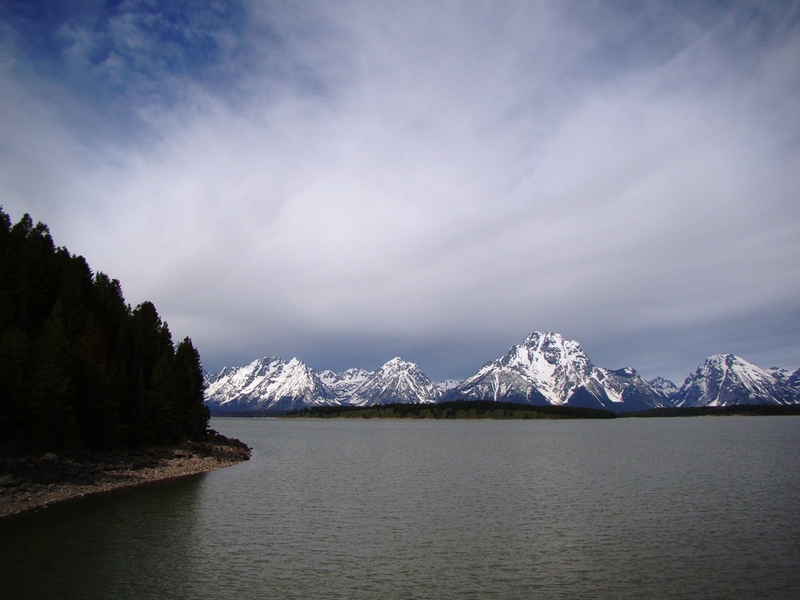 Our next destination was Jenny Lake, which formed behind the terminal moraines of glaciers flowing out from the mountains. It is a beautiful (and very popular) starting point for a number of hikes. I gave the students one of their very precious and rare half-days to hike or do showers/laundry (or, hopefully all of the above). 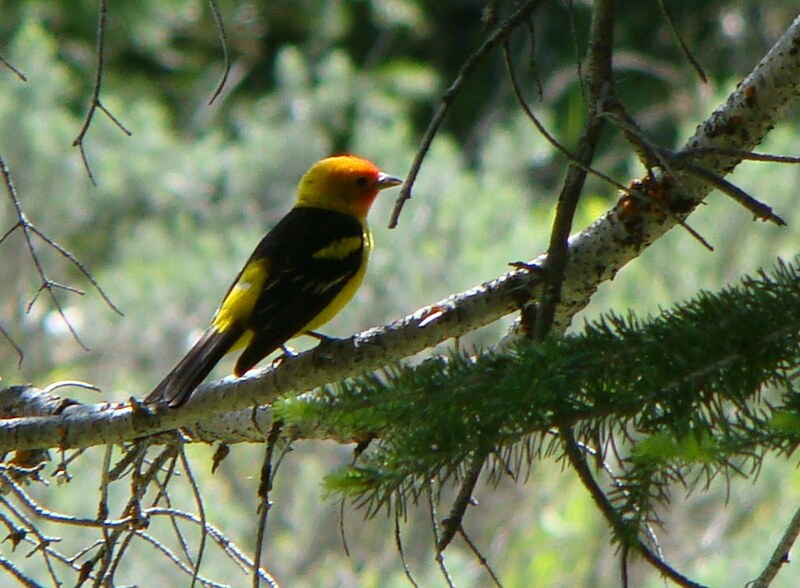 I headed back to camp, but had to stop and photograph a beautiful Western Tanager hanging out in a tree along the trail. The males are obviously very colorful! 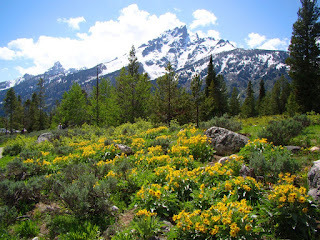 The moraine that dammed Jenny Lake was also covered with beautiful flowers. 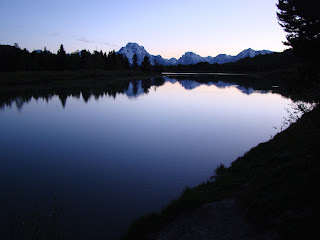 After dinner, we went on a moose-hunt in the twilight, and saw a moose at great distance, but more impressive was the serene sunset reflected on the Oxbow Bend of the Snake River. The next day we would be starting one of the long driving days making our way back home. There were just four days left on our journey. The story will continue in the next post. Say what? Oh yeah, I was once working on a series about our journey across the Pacific Northwest and the Northern Rocky Mountains in June called a Convergence of Wonders (the name derived from the influence of the Cascadia Subduction Zone, a convergent boundary). 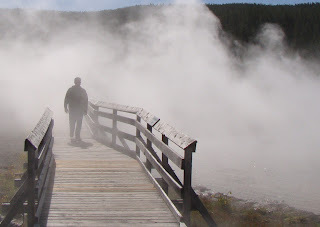 I had reached day 10 when we arrived and started exploring Yellowstone National Park, but was, uh, slightly distracted by another two week trip, a more personal trip. I'm home now, and I expect to wrap up this series now. So what is today's title about? 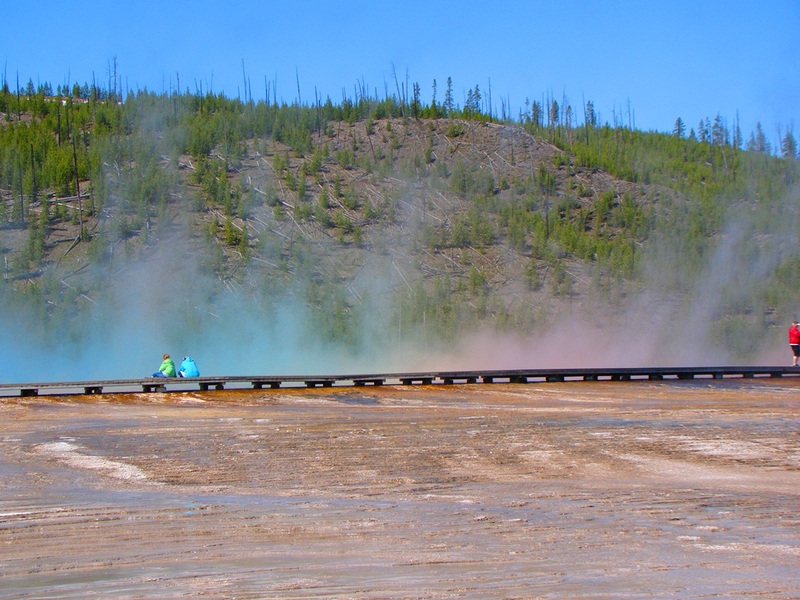 Well, the steam at Yellowstone National Park actually does have some bad stuff in it (high levels of carbon dioxide and hydrogen sulfide) and can cause some real problems for people with asthma and other conditions, but there is no blue steam or orange steam, except as it reflects the colors beneath it. 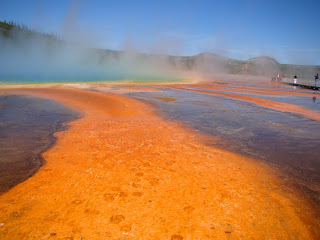 The picture at the beginning is of Grand Prismatic Spring in the Midway Geyser Basin. 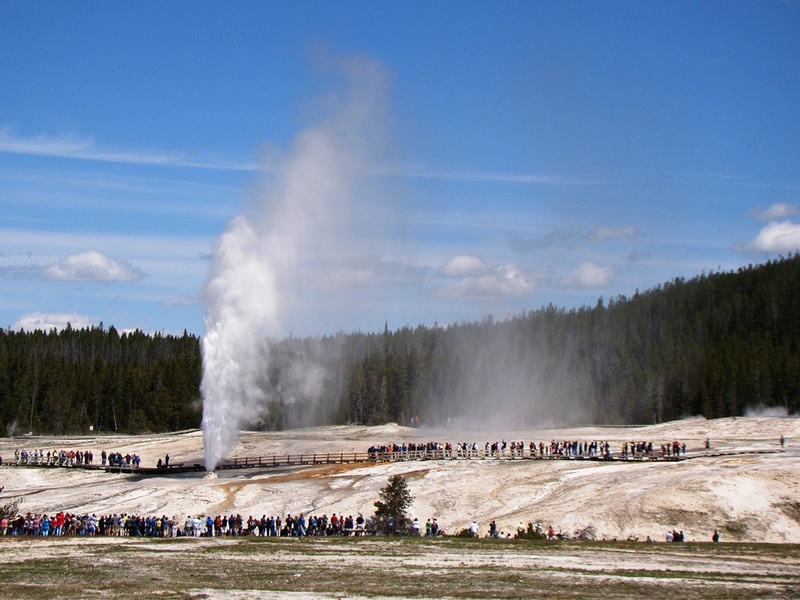 Yellowstone is justly famous for her collection of geothermal features; the 300 geysers in the park account for about two-thirds of all the geysers in the entire world. There are thousands of other fascinating geothermal features as well, including fumaroles, boiling mudpots and hot springs. 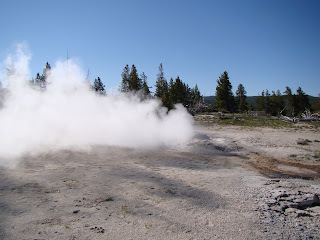 Fumaroles are steam vents. 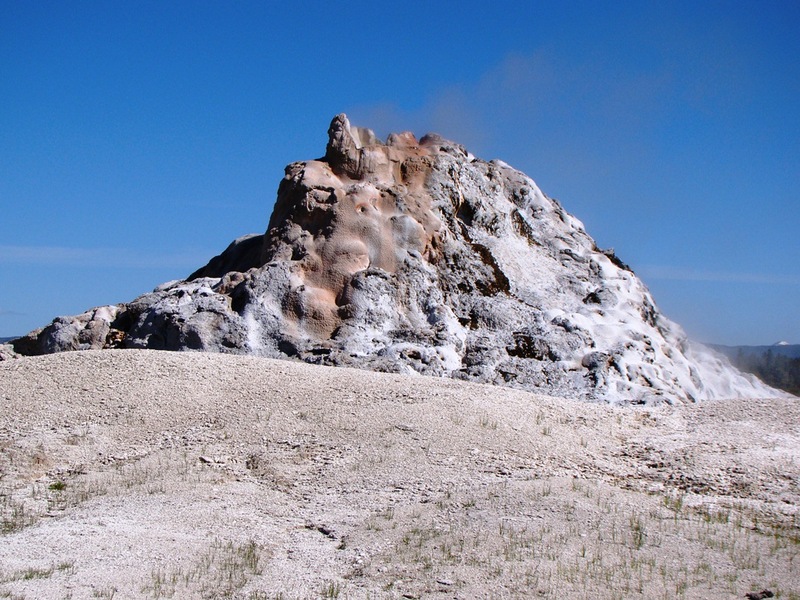 Sometimes fumaroles are short-lived features in the immediate aftermath of violent volcanic eruptions, but in places like Yellowstone (and Lassen Volcanic National Park in California) they are more permanent in nature. 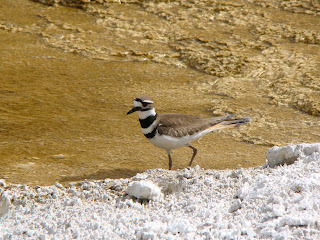 Sometimes they are transitional in nature, depending on the time of year and availability of groundwater. Some geysers erupt so rarely that they might as well be considered fumaroles that occasionally explode. 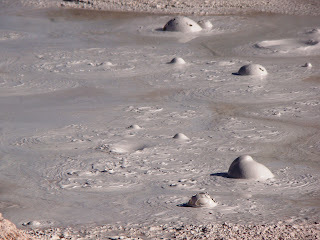 Boiling mudpots are cauldrons of hot acidic mud derived from the weathering of the surrounding volcanic rock. 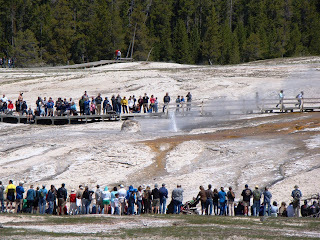 The bubbling mud above is the Fountain Paint Pot near the Lower Geyser Basin. Hot springs are carefully defined as springs that have, uh, hot water. 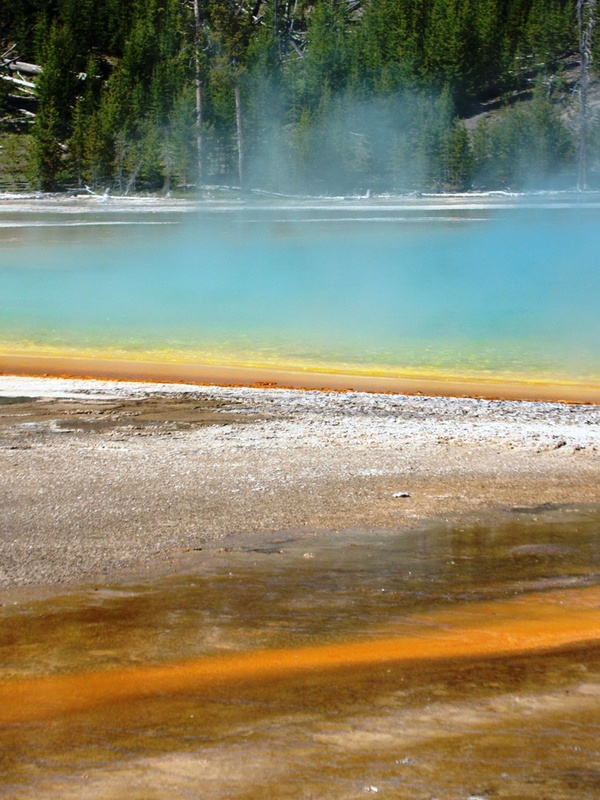 They are one of the most beautiful of Yellowstone's geothermal features due to the interplay of color caused by select absorption of sunlight and the presence of extremophile bacteria (which can survive in near-boiling water). Grand Prismatic Springs is one of the most spectacular features in the national park system, although it is hard to see except from above (there is a trail on the nearby hillside). 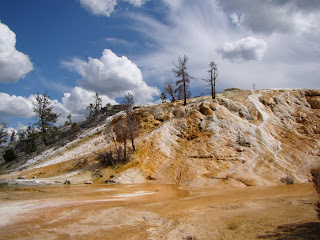 The hot spring we looked at in the last post, Mammoth Hot Spring, was a mountain of calcium carbonate derived from the solution of limestone layers along the pathway of groundwater movement. 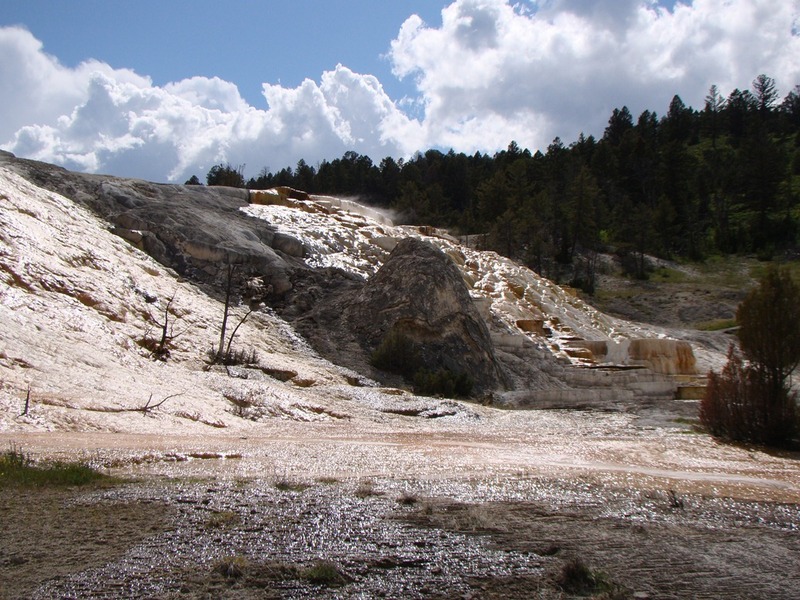 Most of the hot springs in the park are within a rhyolite caldera, and most of the springs have much less voluminous deposits made mostly of silica. White Dome Geyser, below, is the highest silica dome in the park at twelve feet. No trip to Yellowstone would be complete without a visit to Old Faithful. At least that's what I've heard. I managed (quite on purpose) to miss two eruptions while we were there. There's just something about having amphitheatre seating and a giant crowd of people that is off-putting. So what were these people standing around for? The rangers seemed far more excited about convincing people to see an eruption of Beehive. Is that it, that little bit of spray? Oh, there it is! It produced a spectacular eruption! 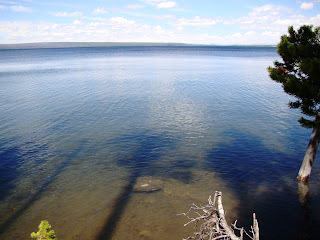 As we started south to leave the park, we made a short stop at Grant Village to have a look at Yellowstone Lake, a huge body of water (132 square miles) that is the largest freshwater lake above 7,000 feet in the country, and possibly the world. The lake lies within the Yellowstone Caldera, and recent activity has caused parts of the lake bottom to tilt. Some shorelines are rising and others are falling. I also took a moment to say hi to Nina Fitzgerald, a ranger at Yellowstone. She is a fellow geoblogger, and has been writing a great series of posts about her experiences in the park system. You can catch her work at Watch For Rocks. 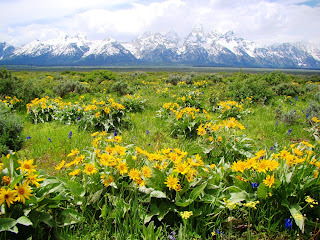 We ended our day by traveling south along the Rockefeller Byway to Grand Teton National Park. More in the next post! 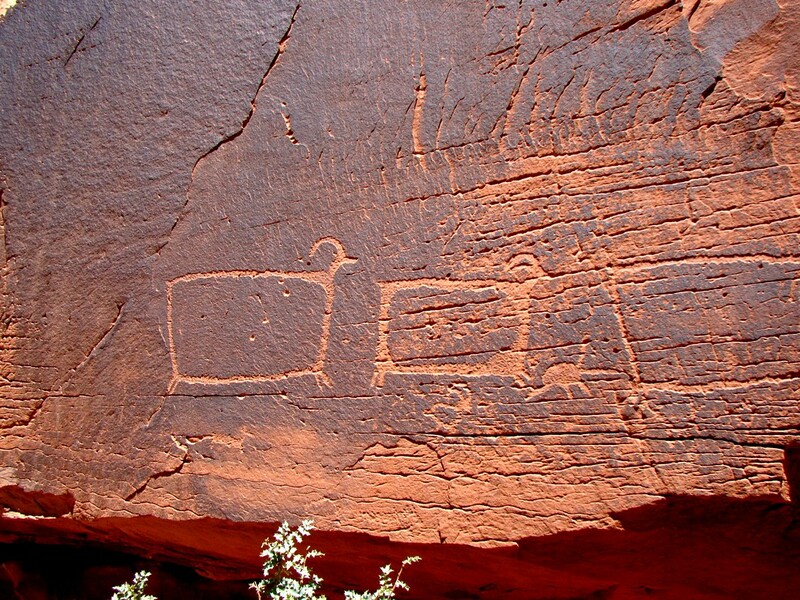 Who was here first in the American West and Central Nevada? 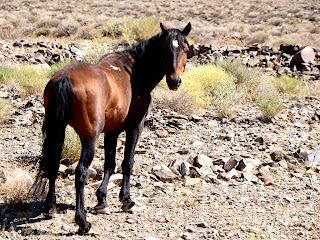 A number of people replied with the correct answer, but Silver Fox from Looking For Detachment had the most accurate: "...wild pre-horses...were here, then native Americans, then the Spanish and their horses which became the first wild horses of Recent times, then ranchers & miners NNITO, with many current wild horses now descended from escapee ranch horses with some Spanish-horse wild blood, modified and bred somewhat by native Americans post-Spaniards..."
The heritage of the horses is one of the greatest stories of evolution in North America. When the dinosaurs were removed from world ecosystems by events at the end the Cretaceous Period (65 million years ago), various kinds of smaller animals began to evolve to fill available environmental niches. 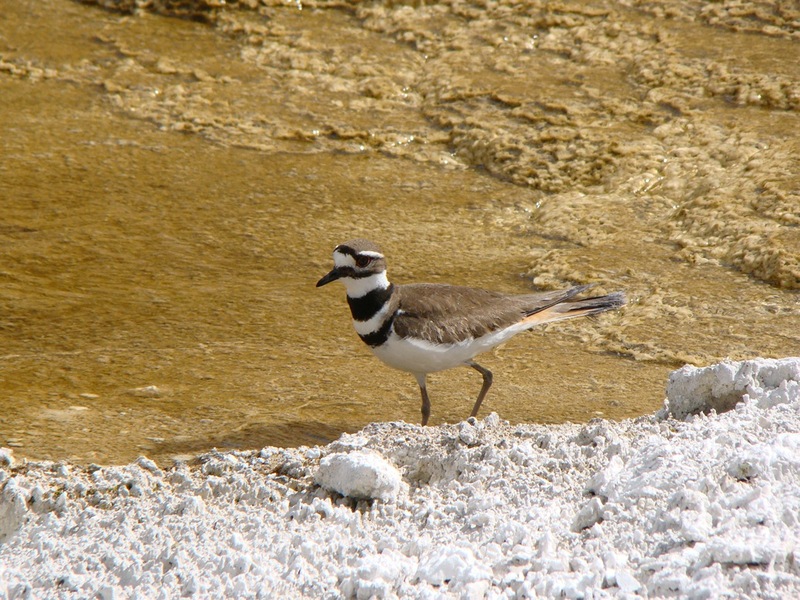 Birds and mammals were highly competitive in terrestrial environments, and within several million years, many new species appeared in the geologic record. 52 million years ago, a small browsing animal called Hyracotherium fed on leaves in the forests. It was the size of a fox, with five toes per foot (though not all were used in locomotion). It was the earliest horse-like ancestor. 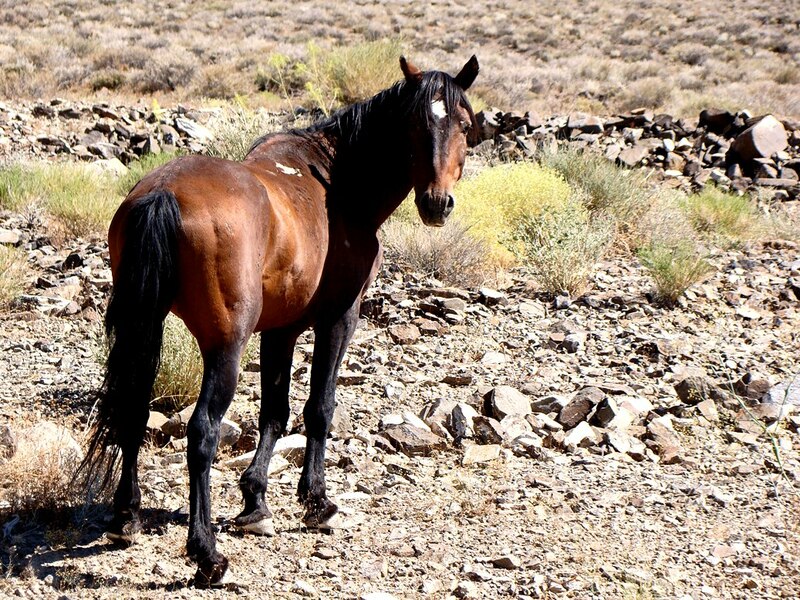 Over the millenia, dozens of horse-related species evolved, with fewer toes and more highly developed hooves. 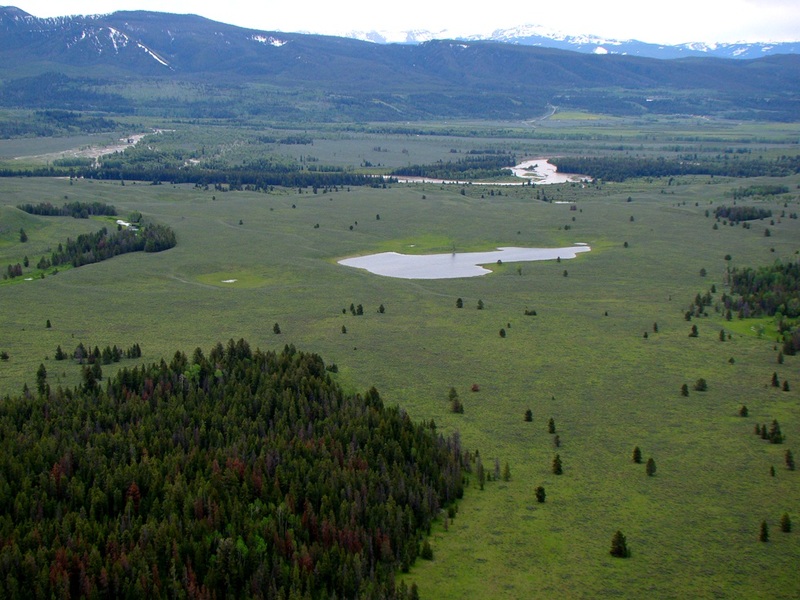 In the mid-Cenozoic, the forests were receding and vast grasslands began to develop. 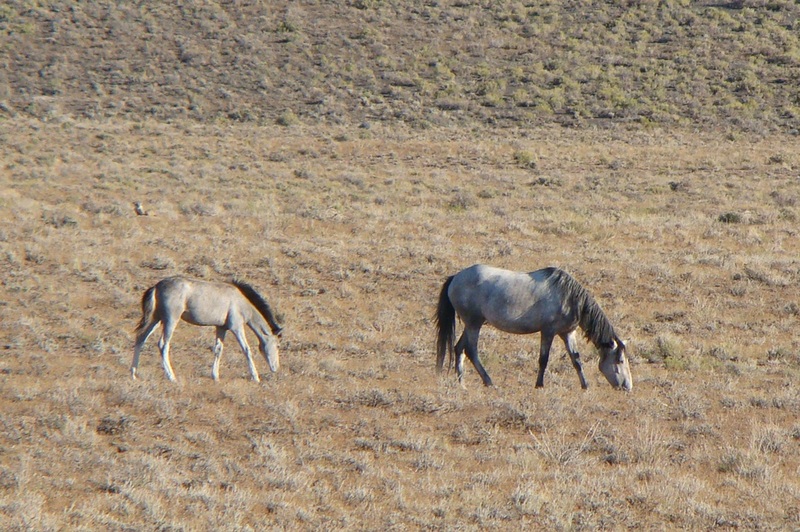 Some of the horses adapted to eating the grass, developing constantly growing teeth that could withstand the silica and dust without being worn away. They also grew larger and faster in order to deal with predators on the open plains. 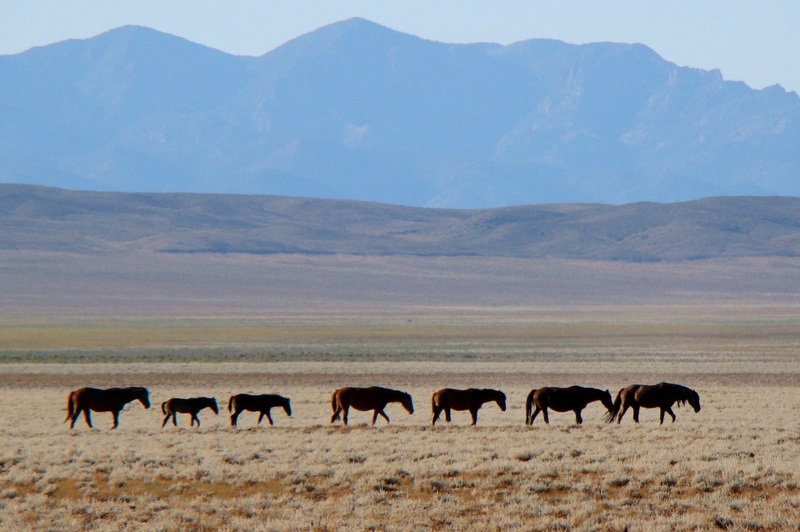 At times, a dozen or more different species of horses co-existed. 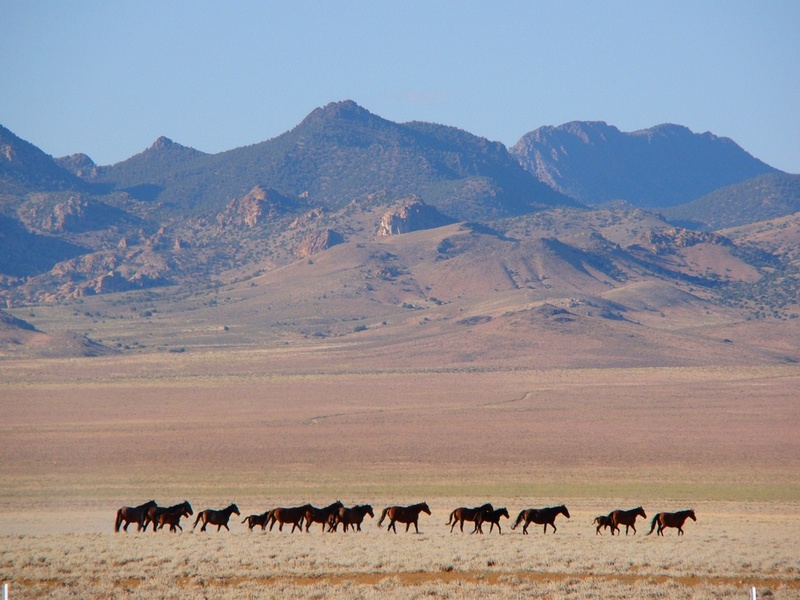 The horses were creatures of North America. Groups of them migrated into South America around 3-4 million years when the continents were joined at the isthmus of Panama. Another group migrated over the Bering Land Strait into Asia about the same time. But their home, the land of their ancestry, is North America. They thrived until around 12,000 years ago, when they and the 30 or so other species of the North American megafauna went extinct. The horses, camels, short-faced bears, giant beavers, sabertooth cats, American lions, dire wolves, and wooly mammoths all disappeared. The reasons are not known with certainty, but climate change related to the end of Pleistocene Ice Age is one possible culprit. Predation by newly arrived human beings is also suspected. There is even a controversial hypothesis regarding a possible meteorite impact. I grant that others have greater expertise than me on these matters, but the climate change idea seems problematic because there were many ice ages, more than a dozen, so why didn't these animals go extinct at an earlier time? The meteorite impact idea is highly controversial, and lacks supporting evidence. Human predation makes the most sense to me, but further research will certainly be needed. So, when Columbus and other Spanish explorers and invaders arrived in the New World with their horses in tow, they were bringing those horses back to their ancestral homeland. They did well in the wild, and over the centuries have been naturalized into the arid landscape of the Basin and Range province. Their existence is controversial, since they compete with cows and sheep for forage, and until federal legislation brought some level of protection, they were hunted and killed by ranchers. Today, they are "managed" by the Bureau of Land Management and other federal agencies, for better or worse. 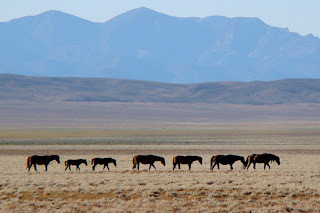 I guess I'm wading into a huge controversy over the management of the horses, but I find it disturbing that there are many who only appreciate horses when they are doing work for us. 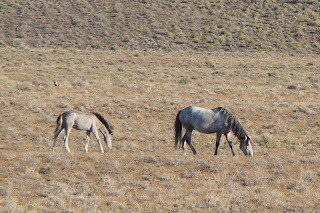 Wild horses living free on the open range are to them a nuisance, as are the coyotes, wolves, and other predators that happen to eat the occasional cow or sheep. 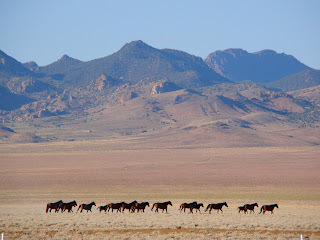 The lands the horses inhabit belong for the most part to all of us, not just the ranchers who borrow these landscapes. What I also know is that there is something beautiful about seeing these animals in the wild. 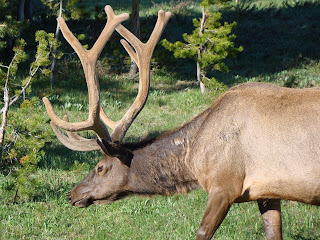 There are so few creatures of the North American megafauna left, so it is a gift to see these creatures running free. It's the last day on the road for us...we'll be home sometime this afternoon. We had our big push across the Nevada desert along another very, very lonely highway, this time on 375 through Rachel. That's the Extraterrestrial Highway to some. It's been one of the finest trips of my life. 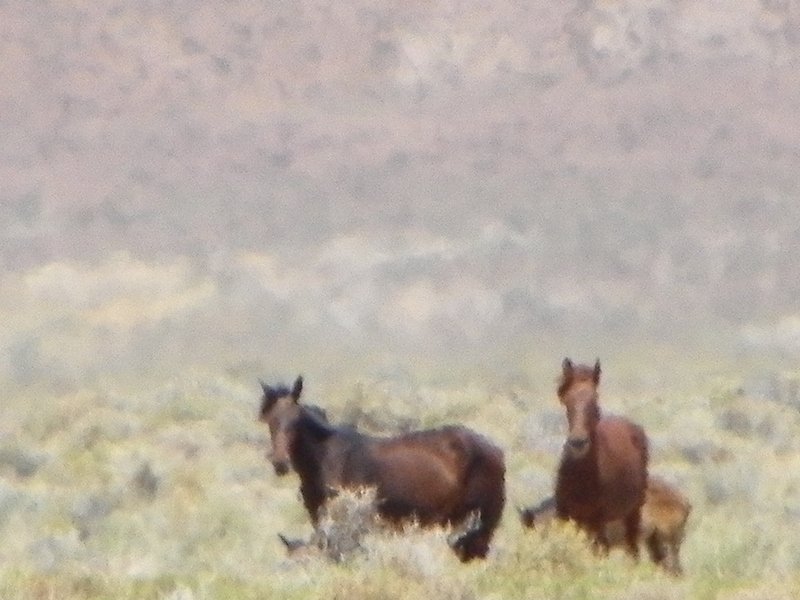 After the long drive, we were only 15 minutes from our destination last night, feeling a bit desperate for, um, facilities, but then we passed a herd of wild horses, and had to stop. They were a beautiful sight. Hint: The answer is complicated, as is the issue. And, there is some geology involved. Looks like I'm on the final day of our extended trip, so normal blogging may resume soon! 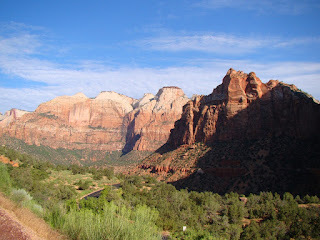 We were leaving Zion National Park before heading across the Nevada desert, and we decided to run up to the Zion Tunnel to have a look around. 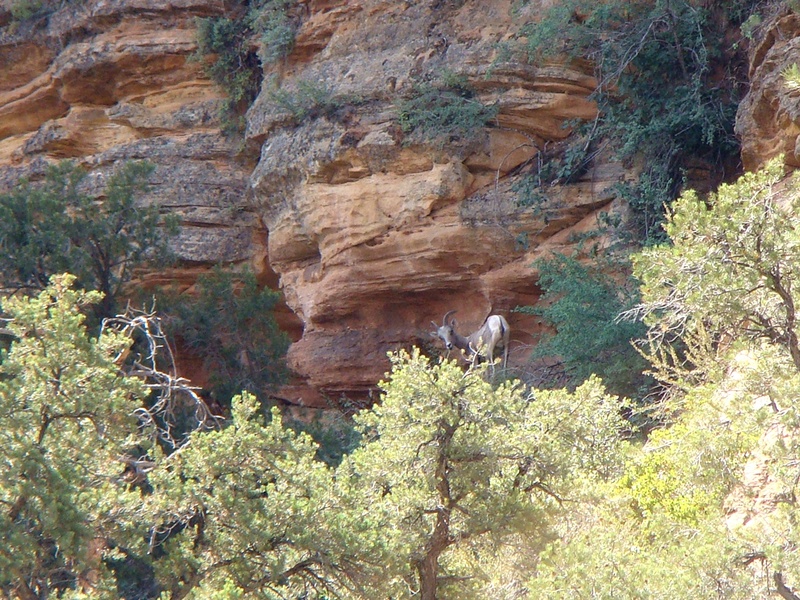 Years ago I had seen some bighorn sheep along the Zion Arch Trail, and wondered if they still hung out there. I didn't see anything right away, so I asked the tunnel attendant if the sheep were still around, and she mentioned that they had been there just a few minutes prior. We started up the trail, and I finally noticed a white spot among all the red and green. It was so far away that I had to snap a photo at extreme zoom and then magnify the picture to see if it was a bighorn. To my surprise, it was (see above; click on each of these photos for a larger image). 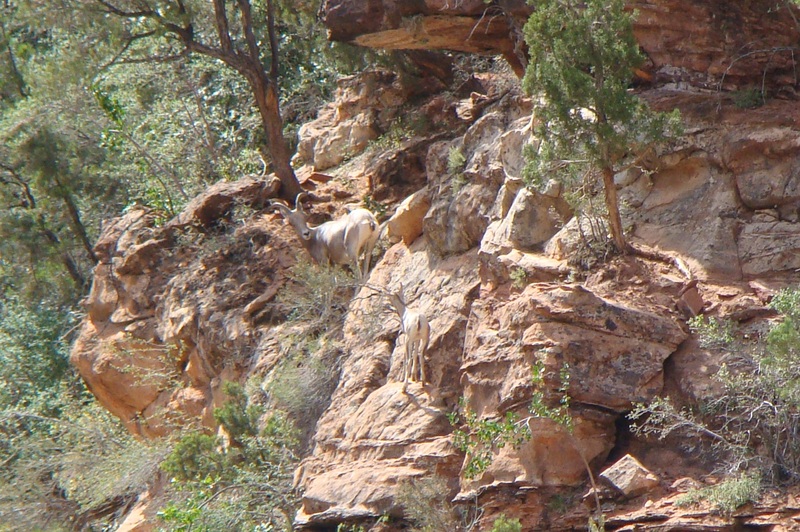 I finally realized that quite a few animals were on the cliffs. A lamb was trying to follow the mother up the rocks. 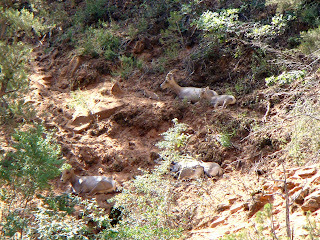 They found their spot among the others, resting in the shade. How many can you pick out? 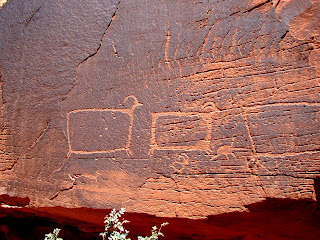 Bighorn sheep were once common across the Colorado Plateau; they are among the most commonly seen animals in petroglyphs throughout the region. 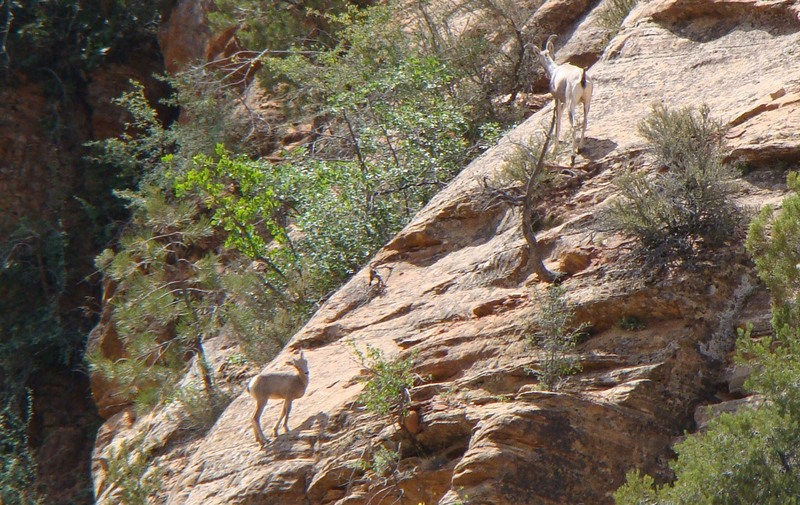 They declined in recent times, often because of diseases that arrived with domestic sheep, and because of habitat loss. 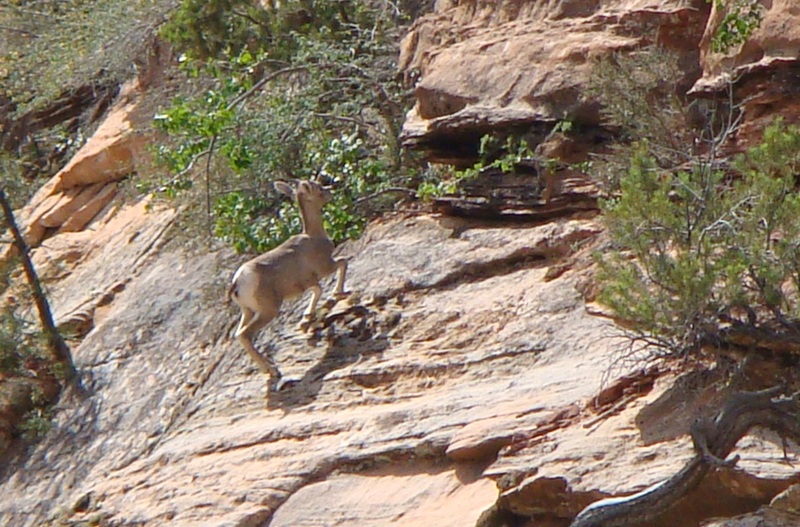 They were gone from the Zion region last century, but a dozen of them were reintroduced in 1970. There are around 150 in the park today. It was a privilege to see them. 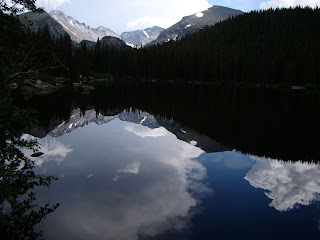 We had a gorgeous day strolling around an almost eerily calm Bear Lake, but in the late afternoon the sky opened up with a tremendous thunderstorm. We delayed setting up camp, and when we arrived later at our campsite, things were peaceful and the night skies clear. The next day, the same pattern built up, a late afternoon deluge, followed by a break, so (having moved to a different campsite) we set up camp and lazily had dinner in Estes Park. When we got back, lightning and thunder were rocking the entire valley, and the skies were opening up with all manner of hail, rain, and wind. We found out there were limits to the "waterproofness" of our new tent, termed the Taj MaHayes by my students. We sat in the car for a few hours, and when things finally settled down, we sopped up the mess and dried off as well as we could. We found out later that the storm dropped inches of rain across much of the park and areas south (Breckenridge got nearly 4 inches overnight). 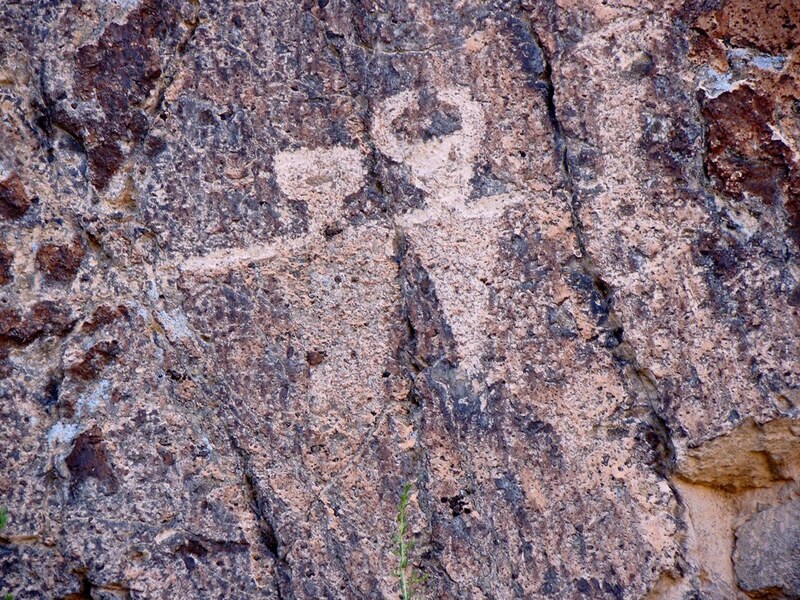 Aliens, Area 51, and UFOs! 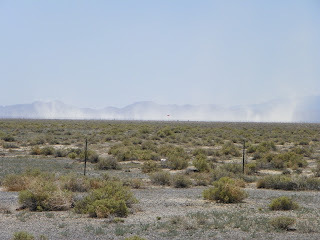 We crossed a very lonely stretch of highway in Nevada, Highway 6, which traverses the empty barren lands between Tonopah and Ely. It runs a bit north of Area 51, Rachel, and the Alien Highway, but we caught our own alien adventure after a few hours of white line fever. It started with the dust clouds in the far distance. What force could possibly be lifting that dust so high in the air? It just didn't look...normal. And then, we saw it. It was hard to photograph, being so far away, but we worked with the zoom to get the most plausible view...it was the alien mothership! It was either making the dust cloud as it rose, or it was producing the dust cloud to hide itself, but we were too observant for that! Now, I know there are skeptics out there who will insist on this myth of dust storms and mirages, but really, who are you gonna believe? A hallucinating tired driver, or those egghead scientists who think they know everything? It's clearly easier to believe in aliens, isn't it? *Disclaimer: I just know someone is going to read this and take it seriously. Don't. I'm just having some fun. The pictures are courtesy of Mrs. Geotripper. I'm interrupting my journey through the Pacific Northwest briefly with other things, mainly a trip to the moon and a trip into the Earth's mantle. I'm currently on the road, just for the fun of it this time, no students, just me and Mrs. Geotripper, and we are exploring the center line of the American West, a line that runs east through Nevada, Utah and Colorado. Today's discovery was on what I consider the real "loneliest highway in America", Highway 6 from Tonopah to Ely, Nevada. Not a single gas station or business for 170 miles. 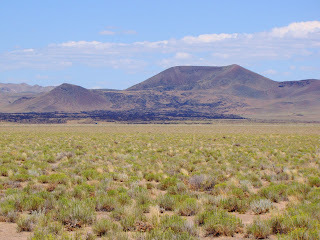 Along the way is a really interesting volcanic area, the Lunar Crater Volcanic Field, an area of 100 square miles or so of basaltic cinder cones and lava flows dating from the last million years or so, with the most recent activity in the last 20,000 years. Astronauts trained in the area during the Apollo missions. About 7 miles off the highway about 75 miles east of Tonopah, Lunar Crater is a big hole, about 3,800 feet across and 430 feet deep. 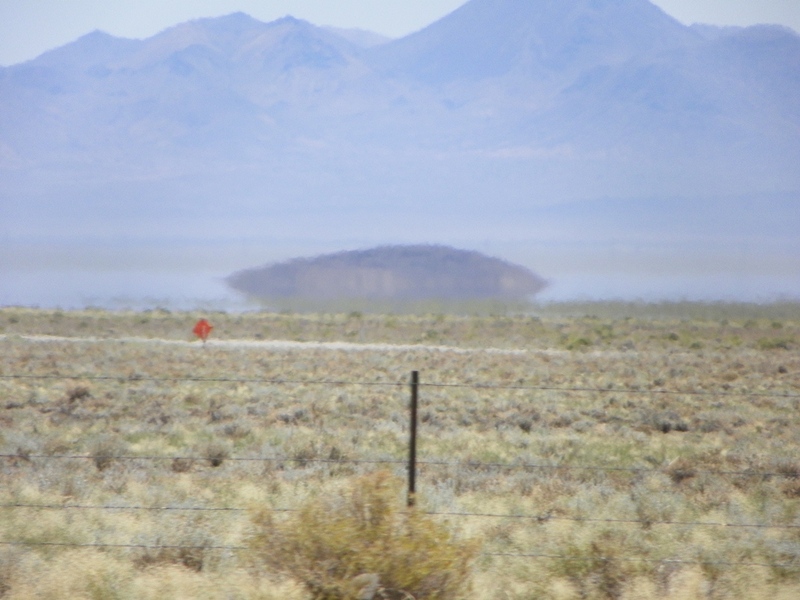 It is not a cinder cone or anything like one. 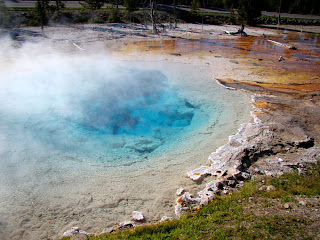 It is a pit caused by the explosion of groundwater when magma came close to the surface. These craters are called maars. 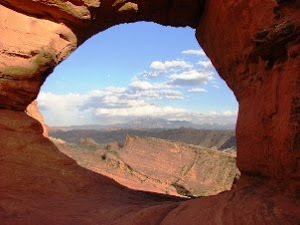 Similar features are seen at Death Valley (Ubehebe Crater), and at Mammoth (Inyo Craters). 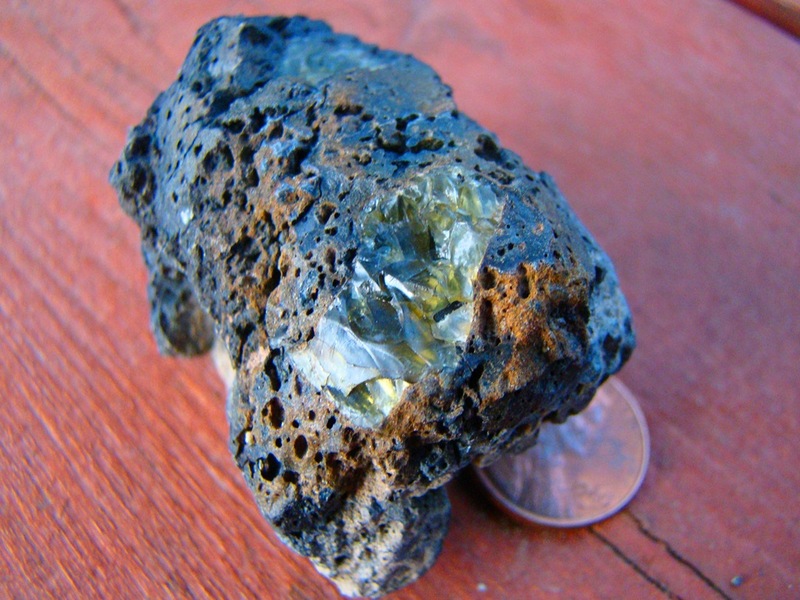 The other interesting item of the day was an olivine crystal that came to the earth's surface from the deep mantle, via a lava flow near Lunar Crater. It's the biggest I've ever found (note the penny for scale). Chunks of mantle that are carried in lava like this are called xenoliths. More when I get a chance, internet access is sparse out here! 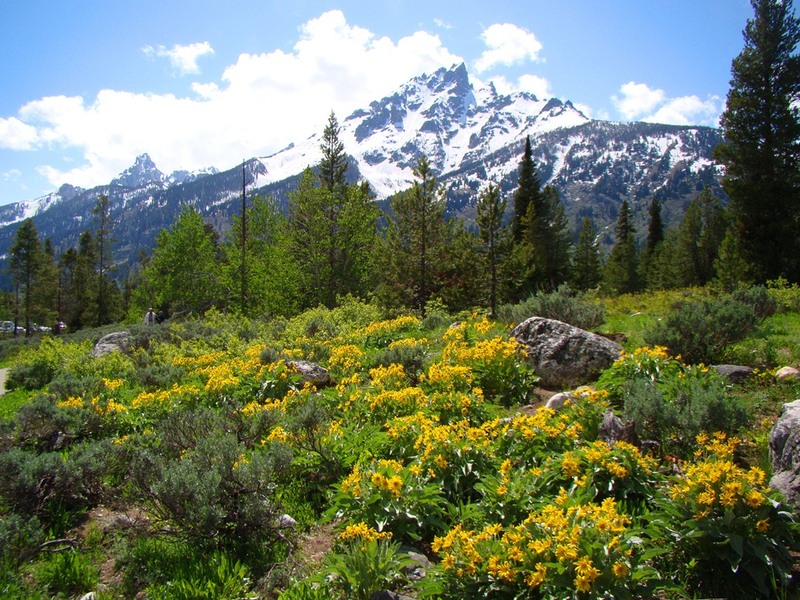 It was day 10 of our field studies journey through the Pacific Northwest and Northern Rocky Mountains. 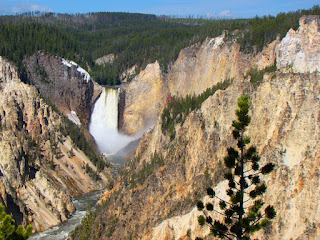 We had finally arrived at one of the flagship destinations for our trip: Yellowstone National Park! 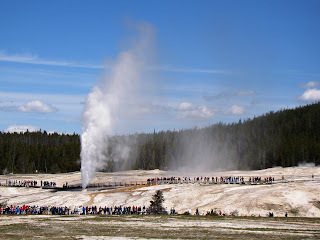 One of the crown jewels of our national park system, home of Old Faithful...we set aside two days to explore the park, and I did something slightly devious to my students. I spent the entire day looking at "not geysers"! Frankly, I'm not sure any of the students noticed the distinction. 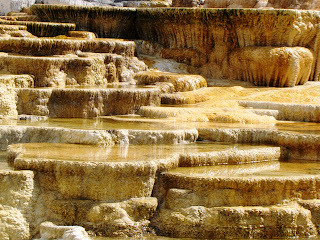 That's the thing about Yellowstone; it is so full of wonders and curiosities that it would be a unique landscape to explore even if there were no geysers to be seen at all. 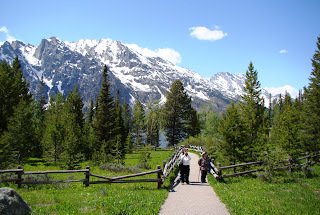 We spent our day exploring the northern loop of the park, from Canyon Village and the Grand Canyon of the Yellowstone to Mt. Washburn and then to Mammoth Hot Springs. 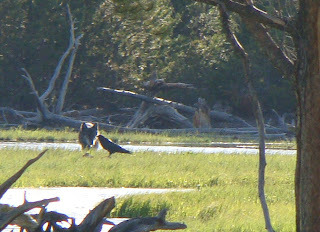 We stopped in at Norris Geyser Basin at the end of the day, but were distracted by a wolf. 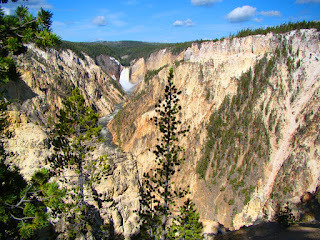 We explored several overlooks at the Grand Canyon of the Yellowstone and Lower Yellowstone Falls. 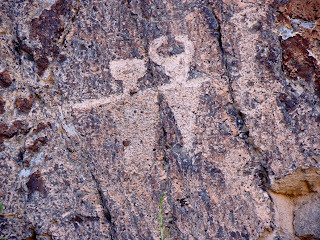 The colorful walls of the canyon are composed of weathered rhyolite just over 500,000 years old. This canyon has been cut very rapidly! Standing at the brink of the 308-foot-high Lower Fall of the Yellowstone, one can feel the powerful surge of the water as it disappears over edge. 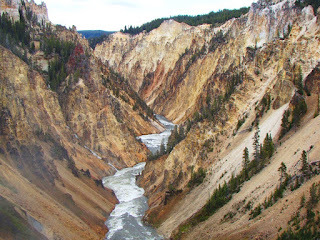 It's not hard to believe that such a deep canyon could be carved by a river like this. 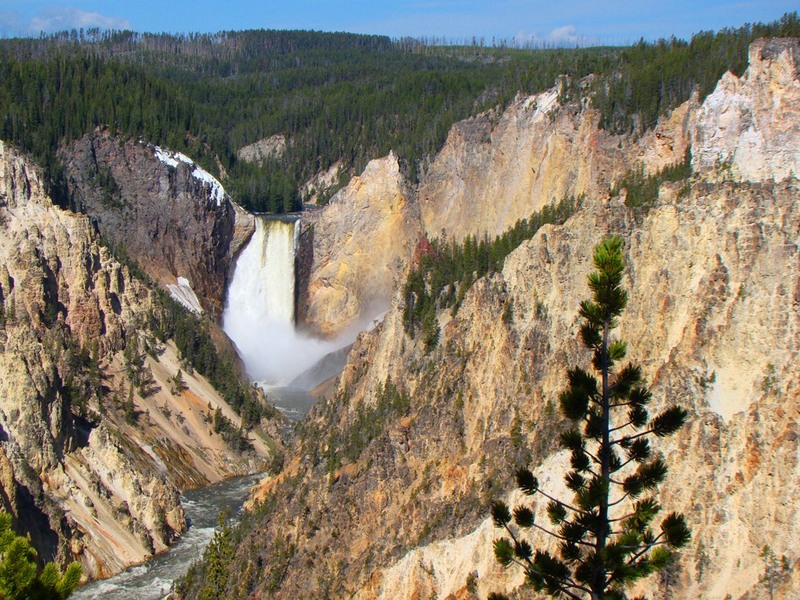 The most astounding story to be learned at Yellowstone was never envisioned by those who established Yellowstone as our first national park in 1873 (Yosemite was set aside nine years earlier, but as a state park). We drove to the high ridge near Dunraven Pass and Mt. Washburn to have a look around. There is a fable about several blind men who were touching an elephant and disagreeing about its nature, whether it was like a rope (the tail), a snake (the trunk), or a tree (the leg). Yellowstone's most striking feature was so big that it was decades before geologists recognized it for what it was: a vast caldera, the site of three of the largest volcanic eruptions to ever hit the North American Continent in recent geologic time (2.1 million, 1.3 million, and 640,000 years before present). How big is the caldera? 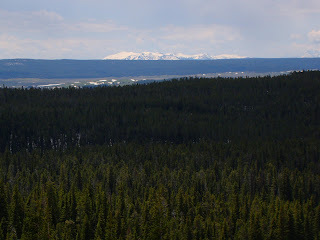 The snowcapped mountain in the distance in the picture below is Mt. Sheridan. We were standing on the side of Mt. Washburn; there is a forty mile gap between the two. 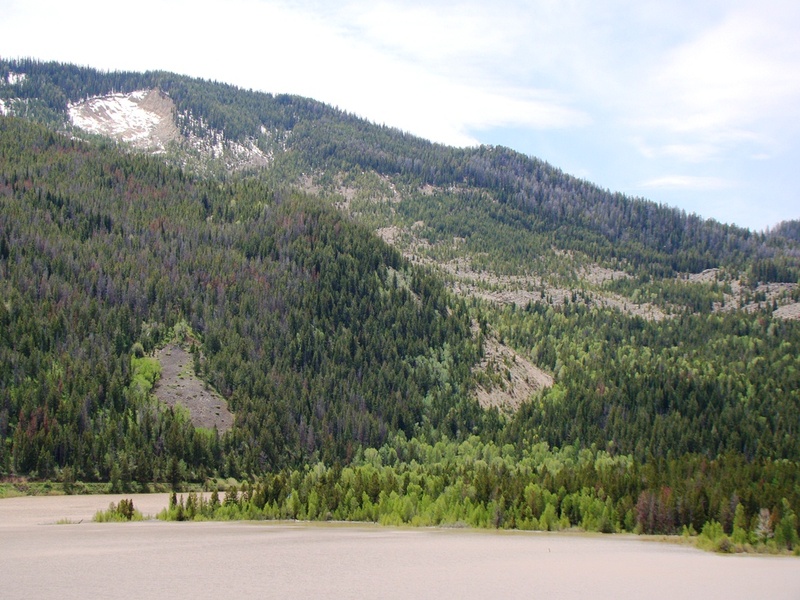 The mountain ridge that connected the two peaks sank into the caldera during a single massive eruption that put 600 cubic miles of ash into the atmosphere. The ash spread for thousands of miles. A repeat eruption would be devastating to civilization (despite what the television tells you, such eruptions are not imminent, nor are they overdue; we would see signs of caldera unrest dozens, if not hundreds of years beforehand). 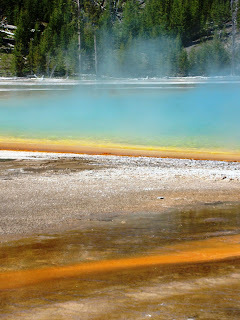 The source of these eruptions is thought to be a mantle hot spot, although there are several alternate interpretations. 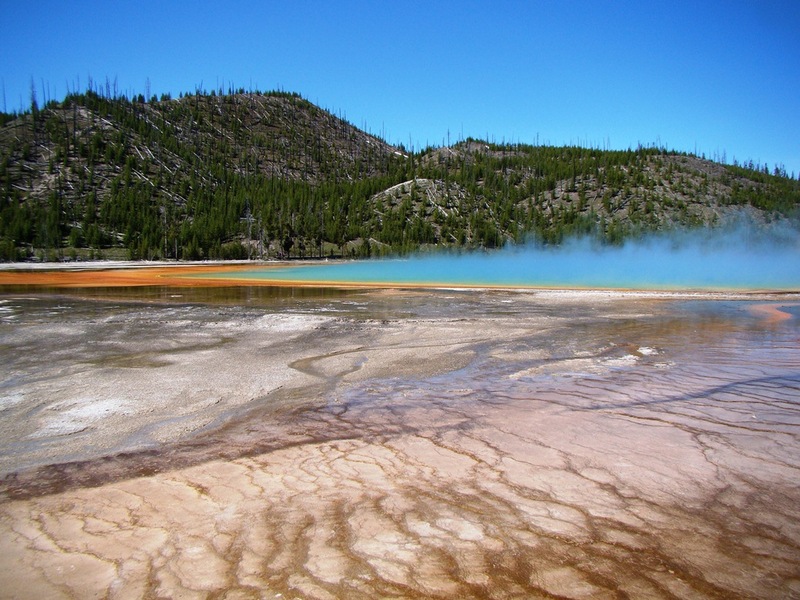 Volcanism has been influencing events in the Yellowstone region for a long time. In early Cenozoic time, around 50 million years ago, the region was rocked by numerous eruptions that produced volcanic mudflows (lahars) that overwhelmed forests of sequoia/redwood trees (You thought they were found only in California didn't you? They were once much more widespread). Each time a forest was destroyed and buried, a new forest would grow in the sediments. 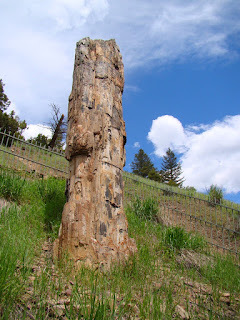 That forest was destroyed in turn, and over time dozens of layers containing petrified logs accumulated. These forests are generally hard to access by road or trail, but one solitary upright trunk can be seen in the north part of the park. There used to be three here, but souvenir collectors carted off the others, which explains the prison in which the trunk resides. We moved on down to Mammoth Hot Springs (with a few bear diversions), and took a look at the strange edifice of calcium carbonate. Most of the hot springs and geysers of Yellowstone do not produce massive mineral deposits, but they happened here, outside the boundaries of the caldera. 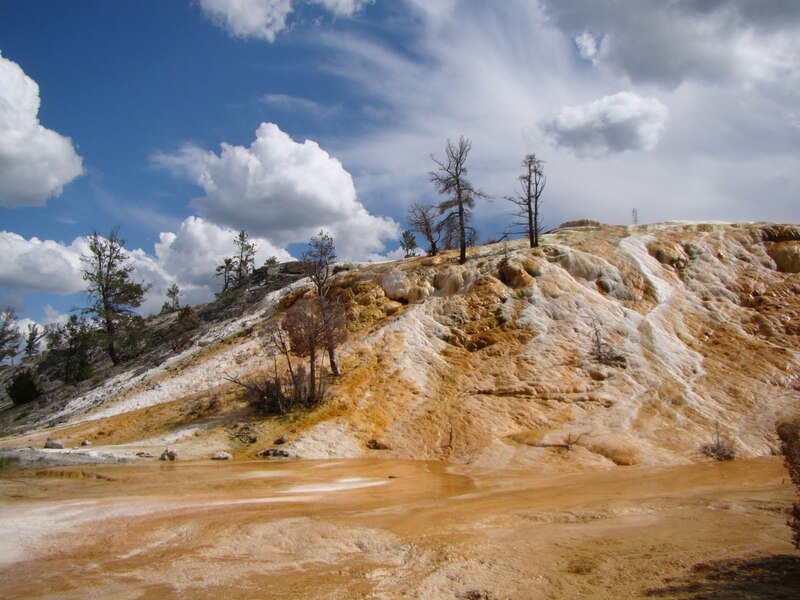 Most of the water emerging from geothermal features in the park is charged with silica, but at Mammoth, the water has passed along faults that traversed Paleozoic limestones. 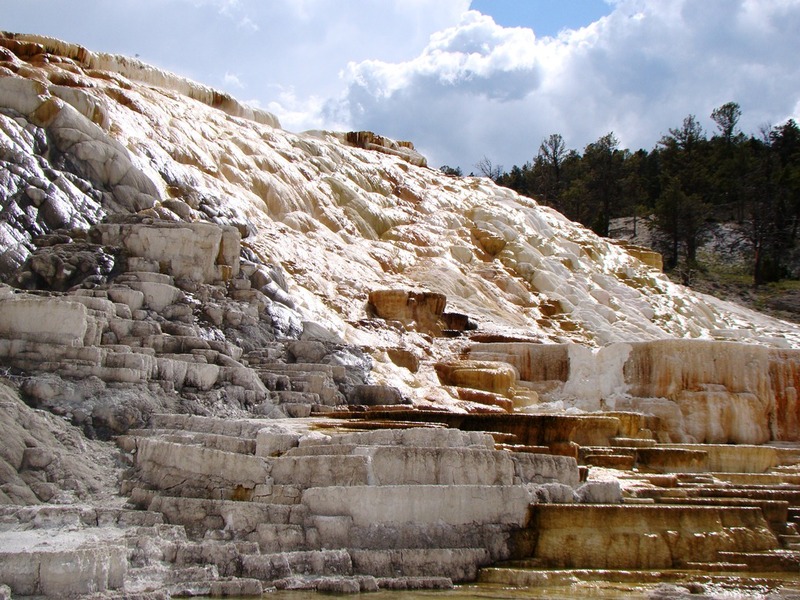 The acidic waters dissolved the calcite making up the limestone, and when the waters emerged here, the calcite came out of solution. 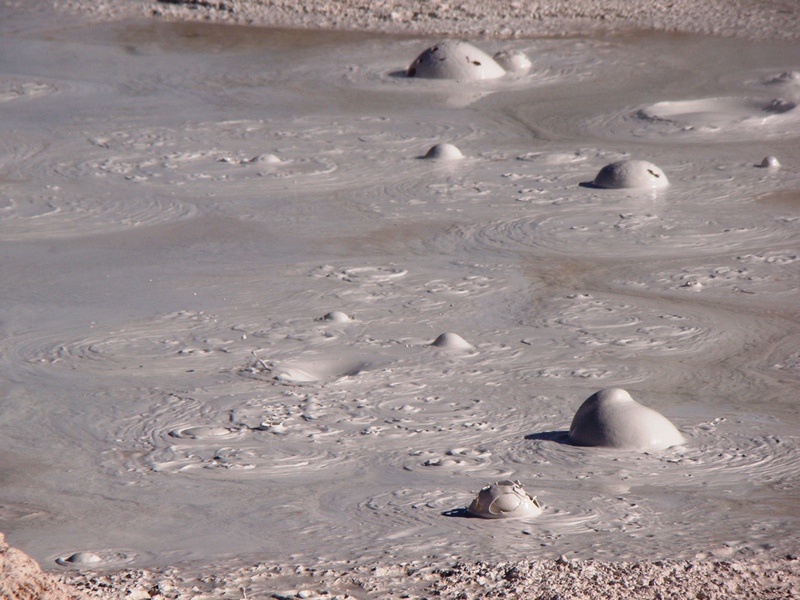 The hot springs are constantly growing and changing location, so the deposits never look quite the same. Heat-tolerant bacteria provide a splash of color to the otherwise snow-white rock. 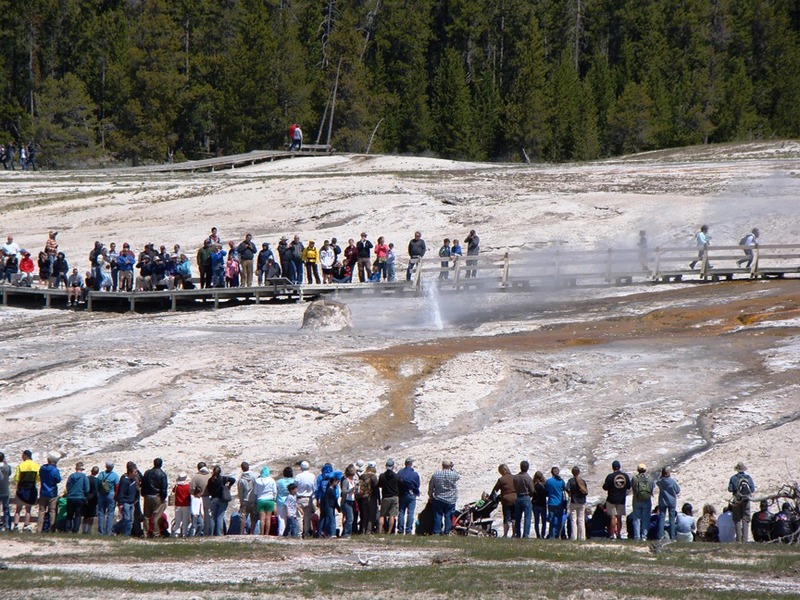 We drove on in the late afternoon to Norris Geyser Basin, but I didn't get any pictures. We were distracted by the whole charismatic mammal thing anyway, the subject this time being a Canis lupus enjoying a meal in a meadow north of Norris. You can see the whole wolf drama in this post. We were done with another day...tomorrow would include the famous geysers (maybe), and Grand Teton National Park. I've been posting regularly for the last ten days, but I am hitting the road again tomorrow, so the next few posts will be at unpredictable intervals, as web access will be tricky. Take care, all!